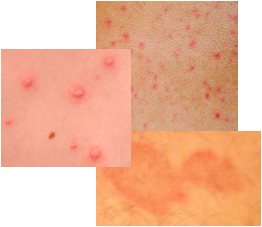 Rash on buttocks and legs possibly caused by streptozyme or strep. I went to a restaurant and ended up sitting in a straw and hay wicker chair. Within ten minutes of sitting in the chair, my buttocks and hamstrings were burning, itching and breaking out severely into some kind of rash. Because of this reaction on my skin, dinner got cut short, and I had to go to urgent care. I was put on steroid and antihistamine treatments. The second time I went back to doctor, she finally did a blood test as per my request and she also performed a swab test on the infected skin area. Today, is my third day going back to visit the doctor. She said I had tested positive for streptozyme or in other words strep on the skin. I am totally mind blown about this because I don't have strep in my mouth. I asked where in the heck I got this from? The doctor said I had to of gotten it with some cut or broken skin and strep got in there. However, my legs look like I have had an allergic reaction to sitting in that chair. I cannot figure this out at all. Now, today, I am on a course of antibiotics and still finishing out the Prednisone. I really really hope my skin will not scar from this. This is one of the strangest and most mysterious experiences medically I have ever had. I really thought I had an allergic reaction to that chair, because I was fine throughout the day. I've had alot of strep throughout the course of my life, but never strep on the skin. I never knew it existed. Anyone that has this reaction, go to doctor immediately, demand a blood test, and have your affected skin area swabbed. I have included a picture of the skin rash.